I decided to have lunch with some very good friends, and was looking for some suggestions. We were all in the mood for something new, and Tara remembered a restaurant a short distance from their place, Uncommon Ground. She knew this restaurant was known for their organic cuisine, but had not been there prior. A unique feature of the restaurant is their organic roof-top farm that supplies a good deal of their organic herbs and produce. It's a great sell for today's organic-trended consumers. I arrived first shortly before 2pm, parked right outside the restaurant with $3 parking on the street (which isn't terrible... way better than the $10 street parking downtown), and to my surprise, was met with a line leading to the host. Once it was my turn, I stepped up and said we would be three for lunch, gave my name, and was shocked to hear there was a 20-30 minute wait... for lunch! I figured there had to be something very special about this place for a 30 minute wait at 2pm, what I would consider later in the lunch hour. I was right! They were busy, which is good to see. Yes, it's a Saturday, but this is not my normal "hang-out" day, so it's fun for me to see a restaurant crowded when I go out. As it was busy, it did take a short while for our server to see us, but that was ok... we were still deep in conversation, and time was not an issue... in all it was less than five minutes. When we did meet our server, she was fantastic. Catherine knew all the specials without fault, and answered our questions without a skip in her step. She was incredibly pleasant and savvy about their menu and property. We ordered some warm beverages, and yes, Christopher's and mine were spiked... of course. He had a cinnamon, chai, whiskey concoction, and I had a Terry's Chocolate Orange Cocoa beverage with orange liqueur, chocolate, steamed milk, whipped cream, and yes, a slice of Terry's Chocolate Orange, which I haven't had in years. I remember whacking the orange ball of chocolate against my Grandmother's table to release the slices of choco-orange-y heaven; it's been at least 10-15 years, and I had forgotten all about them. Now I know what to really use them for! It was perfect for the brisk Chicago weather for which we're currently going broke keeping our houses warm. The beverage came in a huge bowl with no handle that you lifted with both hands. According to Catherine, "it's how the French do it." That was the phrase that totally sold us on the drinks in the first place. Prior to receiving the awesome warm cocktails, we were already changing our minds from what we had seen in the menu to the specials that were so eloquently described. And we were glad we did. Christopher ordered the Seasonal Flatbread, while Tara and I decided on the Eggs Benedict brunch special; and neither of us a fan of mushrooms, requested them left out. The Benedict was featured with caramelized onions, collared greens, and what could possibly be the greatest thing in the world: bacon confit. The Hollandaise Sauce had a great flavor of citrus and the eggs were poached perfectly. Overall, one of the best Eggs Benedicts I have had, and when Erica reads this, she's going to be shocked. Let's just say, I've had A LOT of EBs. Now if they would have thrown a small cut of filet mignon on top for a sweet Steak and Eggs Benny... I would have done back-flips through the dining room. It was a great brunch. The prices I thought were very reasonable for being within the city limits: $12 for the Eggs Benedict, and $9 for the spiked cocoa. 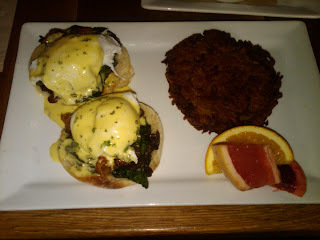 The Benedict was a good portion, with a side of a potato "pancake," which you can see in the photo below. Again, it was a great brunch, and we got to catch up on a good deal of gossip that flows through our social circles like water in a river. Great dining experience, service, and value, Uncommon Ground! Thank you for a fun afternoon! Definitely a fantastic lunch! We will have to get the group together for a repeat visit!